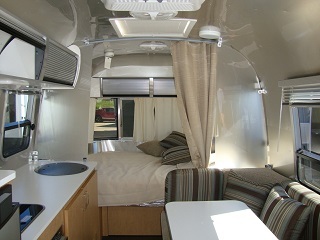 Airstream travel trailers; the trailer with the unique personality. After over 78 years of production they are still one of the most desired travel trailers on the road. The iconic design of these travel trailers is one that can not be missed. They were originally designed to keep down wind resistance and fuel efficiency. They were also the first and only travel trailer to be built of aluminum bodies. To this day, Airstream employees about 400 workers. 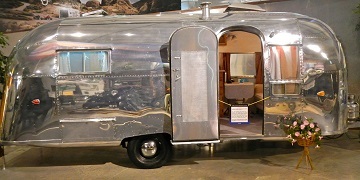 The design of Airstream was started back in the 1930's by Wally Byam. Wally started tinkering with this idea back in the late 1920's and started building them in his backyard in Los Angles California. 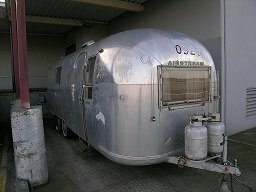 Airstream is the only trailer company from the 1930's still in existence today. They are the most popular aluminum travel trailer today. In 2006 the majority of Airstreams, built back in the early days, were still on the road. Airstreams were not always silver. Originally they were designed to match the cars back in the 1950's. Later decided to go with the iconic famous silver. The oldest Airstreams were DIY'S and made out of wood. Back in 1936 is when the first aluminum Airstream came into the works-The Airstream Clipper. 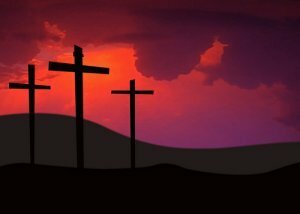 For those of you who LOVE history here are a few links for you to check out, I hope you enjoy! See the worlds Oldest Airstream. These were plans that were sold and built into a 1935 Airstream. I've listed an archive from the 1930's-2007. This is an archive for travel trailers, motor homes, and everything in-between from the Airstream Company. Dating back to the "good ole days" and now days, Airstreams have been used for many celebrities, NASA, political parties, and the military. They have been part of numerous films, movies, and even some recent television shows. 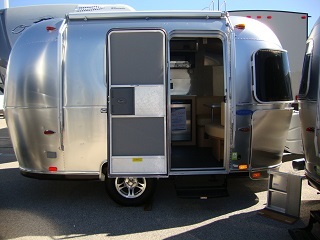 Airstreams have also been dressing rooms or even places to stay while a movie is in progress and filming. So as you can see, Airstreams are quite popular, in the United States and around the world and they have been since their existence. Today's Airstream travel trailers are as innovative as the original Airstream back in the 1930's. To this day, you can still find many older Airstreams on the road. Every rivet is placed into the unit by hand and strict attention to quality is followed through the completion of the unit. Here are some of the advantages of owning an Airstream travel trailer. Airstreams have a very interesting history. They are a very well built trailer, in fact one of the best. They are a safe travel trailer to tow. When you see an Airstream coming down the road, you know it because of the bullet shape and the aluminum frame and sides. Airstreams have a 20% better towing gas mileage because of the arrow-dynamics of the trailer. Airstreams also have a very high resale value. However, there are just a few minor set backs. Airstreams are very pricey new or used, but worth every penny. Depending on the model, they can be very "industrial" looking on the inside. The smaller units, sixteen foot, are where you will find more of the aluminum on the inside. However, the larger and more expensive units are where you will find that it starts to look more like your typical travel trailer. 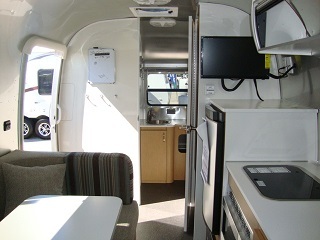 Airstream has produced one model with a slide-out; it is called "The Classic Limited". However; they only made 25 of these units and they can no longer be purchased new. On all other Airstreams there are no slide-out's, so what you see is what you get. Slide outs are nice for expanding your room capacity, but then again, not all trailers slide either. It's a matter of preference here. Airstream Awnings can only be purchased through an Airstream dealer. Sleeping quarters can be limited, but they can also sleep up to six people. This depends on the model of the trailer. They are a very heavy trailer so you need to make sure you have the correct vehicle for towing. It is difficult to get a WI-Fi signal inside because of the aluminum shell. Personally, we think the Airstream is a very well built trailer, but this is defiantly not a trailer for all. You need the right "taste" for this RV, and not everyone likes this design. Now days, they seem to be getting more "family friendly" by having more places for kids to sleep. They are very neat on the inside and out. Sometimes even "retro" looking. So again, it's a matter of opinion here. For the enthusiast or history buff out there, Airstream offers tours of the plant for you to see just how they assemble each unit. Originally these tours were set up so the customers could see there trailer being built. They take great pride in the craftsmanship and you can see that in every unit that comes off of the line. 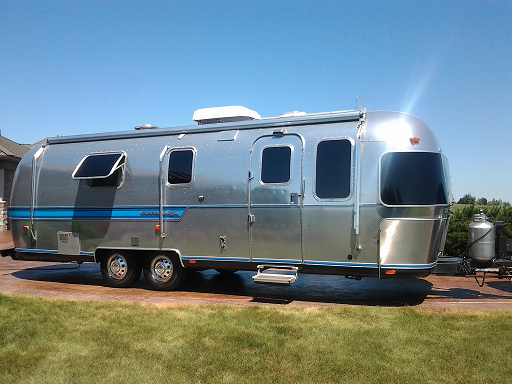 Airstream travel trailers are one of the safest travel trailers out there; due to their aerodynamic design. 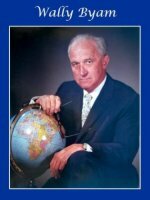 If Mr. Byam were here today, I think he'd be rather proud of where his company is. Tours are every day Monday-Friday at 2PM. They request no sandals or open toed shoes and for hearing and eye protection to be worn. This is a 3/4 of a walk through the facility. Take time and enjoy the journey! You can purchase Airstreams at your local RV dealers.